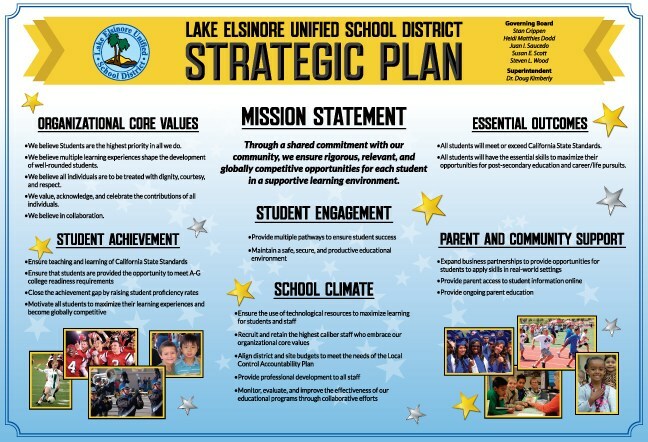 View LEUSD's mission statement, values, and core beliefs in a downloadable graphic version of our current approved strategic plan. We believe multiple learning experiences shape the development of well-rounded students. We believe all individuals are to be treated with dignity, courtesy, and respect. All students will meet or exceed California State Standards. All students will have the essential skills to maximize their opportunities for post-secondary education and career/life pursuits. Monitor, evaluate, and improve the effectiveness of our educational programs through collaborative efforts. LEUSD's Local Control Accountability Plan, or LCAP, is updated annually and establishes goals and measurable actions to implement strategic plan objectives (see menu above).